Temperature Range: -30°C + 125°C. For cleaning and disinfecting, consult IPL’s cleaning instructions. We do not recommend the use of SIP cleaning , which can severely impair the hose life. 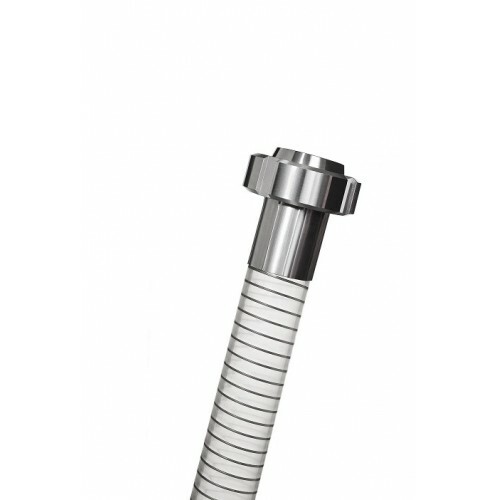 Technical Features: Flexible hose made from TPE hygienic rubber reinforced with AISI 302 stainless steel spiral. Inside and outside completely smooth to enhance flow properties and allow easy cleaning and sterilization processes. Properties: the extruded, low porosity TPE tube reduces permeation problems. Highly neutral in taste and odor, it preserves the organoleptic properties of the medium. Good chemical resistance to acids and alkaline solutions and good impermeability. Versatile rubber resistant also to oils and fats under common use conditions. Cover features: excellent resistance to ozone, ageing and weather condition. Standards: Food grade according to the EU Regulation n° 10/2011 , FDA regulations (Title 21 CFR 177.2600, aqueous foods (e)). Compliant with the pharmaceutical standards USP CLASS VI. Resistant to hydrolysis and proliferation of bacteria. Curing-free material: Pharmasteel does not need any vulcanization process, therefore it prevents the risk of leaching of curing agent residues into the end product (peroxide or platinum volatile rests). It allows to save energy sources and limit CO2 emissions. It can be made electrically bonded according TRB S 2153 by grounding the spiral. The electrical resistance R ≤ 102 Ohm/m is according to ISO 8031 - ATEX Directive 94/4/EC and 99/92/EC). Manufactured under GMP - Good Manufacturing Practice according to Regulation (CE) N. 2023/2006, regarding materials and goods intended to come into contact with foodstuff. Versatile suction and delivery hose designed to convey food, cosmetic, health care and pharmaceutical products. Suitable for a manifold range of media such as premium wines, fruit juices, vinegar, spirits with alcoholic content up to 96%, creams, soaps, milk and by-products; also resistant to products containing oils and fats in accordance with EU Regulation n° 10/2011.